We used to live in a forest. It's been a little over two months since a tornado destroyed most (but not all!) of our forest. Our neighborhood still looks sad, but rebuilding and reroofing has begun! Some houses are even finished! We have our insurance money (only for half a roof) a plan, and a contractor should start on a sunroom addition next week. We took down our deck and cleaned out our pantry in preparation. A huge volunteer effort will help us with re-roofing the non-sunroom area as long as we provide the shingles and supplies. That will start in the middle of July. We've got a carport full of shingles and supplies. We are ready. And lucky. Many of our neighbors are having massive issues with insurance. Some of those have wanted out of the neighborhood for a while. I worry about those. I worry about them leaving shells of houses behind, or selling at a rock bottom price to a low-rent flipper who will cosmetically fix things and rent it out for low prices. My worries are founded, and we, as a neighborhood are doing what we can. This has been my biggest source of frustration. I want everyone here to love it as much as we do, and most of our neighbors do. The boys are ok, for the most part. Little Elvis is a little obsessed with tornadoes right now. We have a book about a tornado that hit our city in 1936. He loves to look at it and talk about it and all of the damage. When playing with his friends, they sometimes imagine tornadoes are coming to get them. He seems fine, but sometimes I wonder if he's not exactly ok. And this obsession is his way of dealing with it. Bob is fine. The storage building/playhouse he built last summer was unscathed. I think he would have been much more upset if it had been damaged. He's a positive, even-keeled person anyway. It probably helps that he's a meteorologist. I'm mainly jealous. I don't like driving through areas that still have beautiful old trees. I think why do they keep their beautiful trees and beautiful neighborhoods, while we don't? Then I feel really petty and ridiculous for being jealous of trees. Trees. We've been very fortunate. We stayed in a friend's basement during the storm. Our house is damaged, but water-tight. We were able to stay with my parents until our electricity was turned back on. It only took 6 days to get power back. And most of the power poles in our neighborhood were knocked down. We had so much help from so many volunteers, and benefitted from so much kindness. Our mayor even helped clean up our yard one day. All of the debris has been taken out of our yard. I got a free wardrobe last weekend (seriously! a free wardrobe of clothes I would never buy for myself!) The boys got a gift card to Chuck E. Cheese. We've experienced lots of kindness. I don't know why I sometimes focus on the trees. My mom let Cheese Puff pose for her cell phone on Sunday. Here's a selfie. Here's a thoughtful pose. She was trying to get one of his funny expressions. They don't last long enough. He's still sweet. Very sweet. We spent the day with Granny, and he had a blast showing off for her. She usually tickles him, but he turned the tables on her and tickled her. He had so much fun. Then we visited Gram and then went to pass out some stuff in the neighborhood near my church. He was great. I expected some 2-year-old hijinx, but there were none. It was a fun day with my littlest boy. 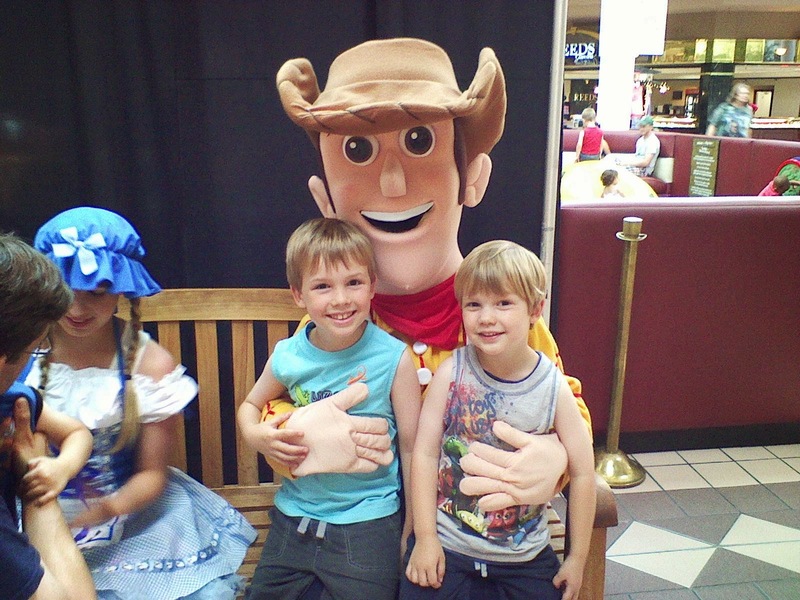 The boys got to meet a "movie star" at the mall this morning. 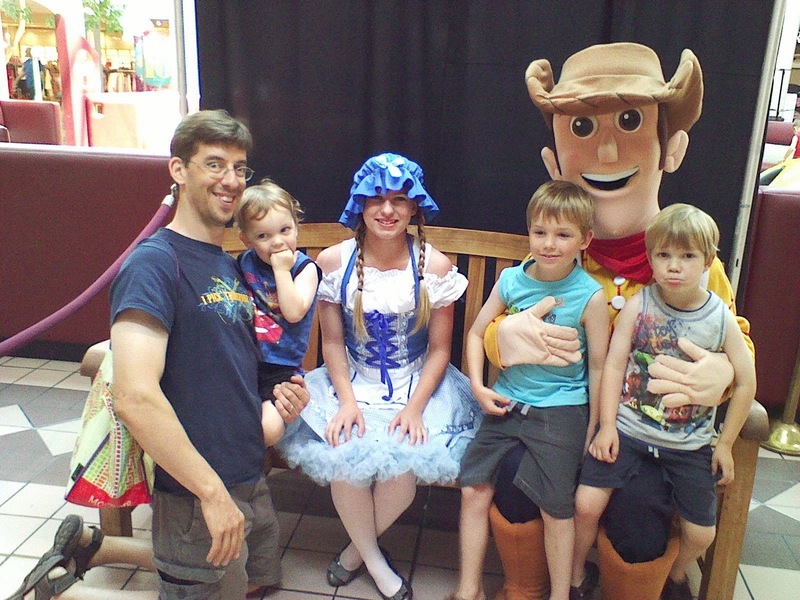 Woody and BoPeep from Toy Story were there. Our mall does this every once in a while, and we think it's really nice. As long as it's not a princess, the boys are more than happy to meet the characters. At least two of them are. Little Elvis and Baby Plum were game for this meet and greet. Cheese Puff, who had been talking all morning about meeting Woody was excited at first. Then, he realized that this huge creature with a huge head wanted to shake his hand. He refused. He told Woody that he was scary. I think the dark socks pulled up high are a boy trend thing. Not sure what to say about the white golf shirt and bright blue shorts. He was proud of it. Little Elvis has been in theatre camp this week. They'll do a little play tomorrow. He tells us he's the star. He gets to speak to older kids and he's got 6 lines! He's had a blast. Once he gets home, he scarfs down something and runs to play with his friends. On Tuesday he told me he wanted a grab n go lunch. I had no clue what this was, some brand name something? Some fast food something? No. It was something that he could grab and eat while he ran to his friends. He took a banana. It wasn't super-filling, but it was something he could grab n go. Just in time for Cheese Puff to hit them. And hit them, he has. Wow. Usually, he's super sweet and loving and polite. He's my best thanker. He thanks everyone. It's incredibly sweet. Then, especially when he's tired, he starts screaming. Last week, during our weekly trip to Sam's, all hell broke loose. Cheese Puff says he wants a hot dog, but he really doesn't. He wants Baby Plum's pizza. Baby Plum is usually nice enough to share (notice, I didn't mention any terrible twos with Baby Plum.) We decided instead of our usual order, Bob would get a slice of supreme pizza and I would get a hot dog. Cheese Puff could eat the two pieces of my hot dog that he usually eats, and then have some of Bob's pizza. Cheese Puff loves supreme pizza, so this wasn't a problem. Except that it was. He didn't want the hot dog cut. But he did. But he didn't. He wanted to cut it himself. But he didn't. But he did. He didn't want pizza. But he did. He didn't want his brothers to eat pizza. He didn't want his daddy's pizza. He wanted hot dog. But he didn't. He didn't want anything to drink. But he did. At least he did when his brothers had it. Picture this whole scenario with him screaming. the. whole. time. Some old ladies seated next to us glared. It was downhill from there. Shopping for our groceries was a mess. A similar scenario happened at our grocery store two days later. We ended up feeding him blueberries right out of the container. I know. See how sweet? That poor, tired baby. He screamed at Little Elvis for trying to hold the popcorn. Then he passed out. Also, Baby Plum has decided to try his hand at the terrible twos as well. The fits don't suit him, but he's trying it out anyway. His fits usually stem from something Little Elvis has said or done. Do you see what I see? Cheese Puff started sprouting curls a couple of weeks ago. He's had a few hair trims, so I think this is odd. I'm excited, though! My dad says it's just the weather, but we had hot, humid weather last year, and his hair was straight. My hair currently isn't curling. I think we've got a late-bloomer when it comes to curls. I need to take a prettier picture, and then let it grow out! My parents' church had VBS this week, and the older two boys went. It was spy-themed. Perfect for Little Elvis. On the first day, he dressed like a spy. I pulled out his Agent P hat from his Halloween costume when he was 4. Bob loaned him the shades, and the attitude was all Little Elvis. He played with his friends in the neighborhood later that day, and the boy said he didn't see him at VBS. I said, it's because he was dressed like a spy. He wore the hat and glasses on Monday and Tuesday. His teacher told me kept them on the entire day. He seemed to forget about it after that. His teacher from this year was there, and he was glad to see her. He said after school this year that he was really going to miss her. We thought that was sweet. Ever heard the saying, "Warts and all?" Well, I'm not a fan of that saying. While I love Little Elvis, the huge wart that has been in the palm of his left hand since he was four was not high on my list of things to love. It was huge. The home freezing things hurt, and didn't really work. The liquid didn't either, more because I wasn't consistent enough. Same with duct tape and fingernail polish. He fell twice last year on his scooter and scraped off the top layer. We were convinced that would do it. But it came back bigger. Today we took our 7-year-old to the doctor to get rid of it. We weren't sure how they'd get rid of it, and just kept saying wart removal. He was fine with this plan. When he asked if it would hurt, we told him we didn't know. But we did. We knew it would. We went in armed with a set of gummy fast food things. He's gotten gummy hamburgers before, and loved them. This set had gummy hamburger, hotdog, French fries, pizza and soda. I told him that whenever he screamed, I would shove a French fry in his mouth. He thought that was funny. This is the offensive wart right before the doctor got to it. The appointment didn't start off well. The doctor came in, and said that 7 was a bad age for this. He recommended using wart removal liquid with electrical tape on top. We thought he was going to try and send us out the door after all of the buildup we've had with this appointment. Not to mention the office fee would have gotten. Luckily, he said he would try it. He said it would hurt. He said it would be several minutes of hurting. I said that's why we were both there. He pulled out a fire-extinguisher looking thing to freeze it. Little Elvis laid down on the table, I held the top, Bob held the legs and he started freezing the wart. At first it was fine. Then the pain started. He screamed and screamed. The doctor got kind of frustrated with the yelling and we gave him gummy pizza slices and gummy fries. We promised him the Disney Infinity Dash that he wanted. We told him about our planned day trip to the big city. It was several minutes of him crying and sometimes screaming. It was hard. It hurt. But it ended. The doctor said he was glad it was over, because we might not be able to afford any more promises. Little Elvis still cried some, but the pain didn't last long. He was told to try not to touch it, and he's been worried about every accidental touch. But he's fine. It looks the same. But it's supposed to scab over, then the blister will ooze. We'll bandage it then, as well we can bandage the palm of his dominant hand. Then we will know if it's gone.